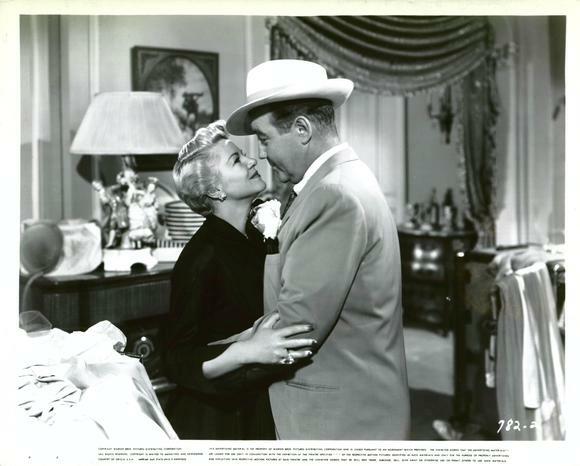 Broderick Crawford and Claire Trevor star in STOP, YOU'RE KILLING ME (1952), recently released by the Warner Archive. 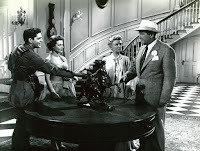 In this lightweight remake of Edward G. Robinson's A SLIGHT CASE OF MURDER (1938), Crawford plays bootlegger Remy Marco. Remy has it all, including a devoted wife, Nora (Trevor), who has his slippers and a glass of milk waiting when he gets home from a rough day selling illegal booze. There's just one problem: the end of Prohibition. Remy decides to go legit but discovers that running an honest business is a financial challenge, to say the least. Meanwhile he has other problems: his daughter Mary (Virginia Gibson) is in love with a wealthy young man named Chance (Bill Hayes) who's decided to earn an honest living as a state trooper; there's a bank robber (Harry Morgan) on the loose hiding in Remy's rented vacation mansion; and said robber has left four bodies in an upstairs bedroom. And oh, yes, Chance's wealthy mother (Margaret Dumont) is stopping by to meet her son's future in-laws. 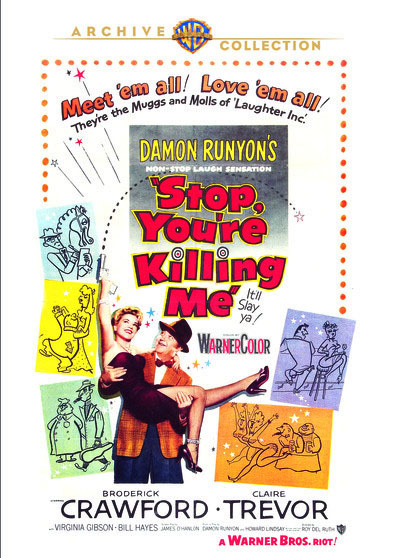 STOP, YOU'RE KILLING ME is a mildly diverting film, thanks chiefly to a cast which also includes Sheldon Leonard as one of Remy's former "business associates" who's now one of his servants. Familiar faces like Howard St. John, Ned Glass, Don Beddoe, and John Crawford turn up. You can even spot a young Phyllis Kirk as a nurse. 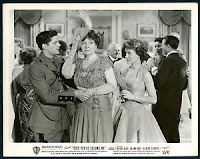 The movie doesn't really come together all that well, however, with awkward elements including a bratty orphan (Louis Lettieri) Remy takes with the family to the country. He's just not funny, and other than the fact he keeps the bank robber busy, he's a fairly extraneous character. The movie can't quite decide whether or not it wants to be a musical and fits in a couple numbers, but not enough to make it feel like a true musical comedy. Trevor does a couple of songs -- one with Crawford! -- but musical stars Gibson and Hayes only have one song and dance together. Gibson, who would later appear as Liza in SEVEN BRIDES FOR SEVEN BROTHERS (1954), spent a few years at Warner Bros. in supporting parts like this one. She passed on in 2013. This was the first screen appearance for the very young Hayes, known for both DAYS OF OUR LIVES and his singing performances. Last summer at UCLA I saw him as Bill in the 1958 TV version of KISS ME, KATE, starring Patricia Morison and Alfred Drake. The movie was directed by Roy Del Ruth. 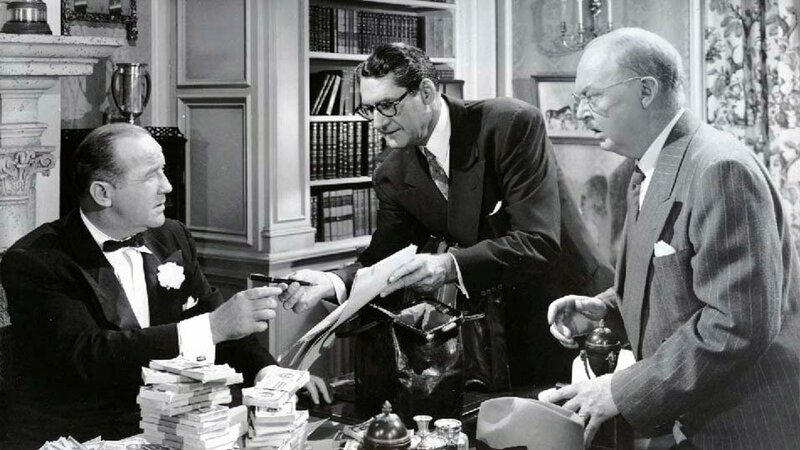 It was filmed in Warnercolor by Ted D. McCord. The running time is 86 minutes. In the end you've got a great cast carrying a fairly weak film. Worth watching if you like the names involved, with some good moments scattered throughout, but they've all done better work. The Warner Archive print is quite variable. A few of the scenes are gorgeous, showing off the colorful sets, but numerous other scenes are very faded or scratched. There aren't any skips so the print is still watchable, but viewers should be aware what they're getting going in. A picture one wants to like but can't quite, despite all the talent up there on screen. In black and white, produced in 1938, a hit. I have the original film in a boxed set and have not yet seen it. I'm curious to try it out! I haven't seen the remake but I bet you like the original . I can watch anything with Claire Trevor so thanks for highlighting this film. I haven't seen it (I saw the original 1938 movie which is a delight, like two other Lloyd Bacon/Edward G. Robinson gangster comedies LARCENY, INC. and BROTHER ORCHID), and feel I probably wouldn't look for it, but it is interesting to note the presence of Bill Hayes. Despite his very real and considerable charm (and great singing voice), I guess he was simply not destined to click in movies (he has a pretty good supporting role in THE CARDINAL many years after this). But Hayes' stage career was a good one, with the highlight being the male lead in the mostly unsung (sorry) but truly brilliant ME AND JULIET (1953) by Rodger and Hammerstein, their most underrated work. This was a show my wife Linda actually saw in New York as a girl and still cherishes the memory. I'm a Trevor fan also, Vienna! And she was important locally, married into a very wealthy philanthropic family; the Claire Trevor School of the Arts is located at the University of California Irvine here in Orange County. Blake, after reading comments here and elsewhere I will have to watch the original film soon, it sounds good! Thanks so much for contributing such wonderful comments on Bill Hayes. I've only read the script for ME AND JULIET, in a book of R&H scripts years ago. It had escaped me that Hayes was one of the stars, great to know that. How fantastic that Linda saw the show!